I recently realized that one of the server perimeters says "Ranked". Of course all of them say no but i am interested if this will be a new feature and would love the heck out of it if it would be, assuming that means you would play players on your own level. 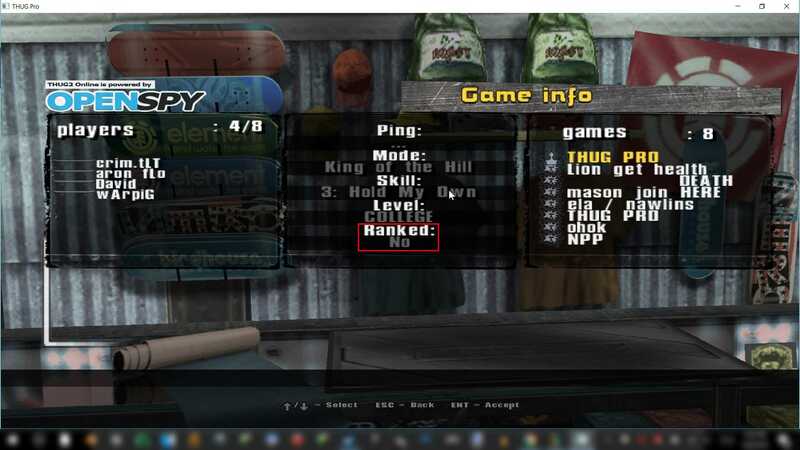 yep the Ranking system was introduced on THUG1. You could limit players from entering your room based on their rank. This also saved your highscores in each level on the server and you could compare to everyone else. The Ranking system requires the login system. That is currently disabled in thugpro. Once Openspy is 100% on the updated servers, the ranking system backend should be operational and the thugpro devs will have the option to enable the login system in thugpro, if they choose to do so. I would love for this to all work out and get back the login/ranks. There could be lots of new functionality, like support for new game modes, recording # wins, etc. I need this! Hope this happens soon but i found another post from a while ago talking about this so i hope it is being actively developed and could happen.